Digital Mom Blog > Technology & Web > Minecraft > Free Minecraft Invitations for Print or Evite! Free Minecraft Invitations for Print or Evite! Looking for free Minecraft Birthday Invitations? We have a FREE printable one – just for you! I don’t know about your kids, but my kids are OBSESSED with Minecraft. Listen, they love video games and if I didn’t put a cap on their playtime, I am pretty sure we would have 2 kids that didn’t sleep that just played Minecraft AROUND the clock. In addition to our 2 older kids, – a boy and girl, our 3-year-old found the Minecraft app on his iPad and has started playing as well. He doesn’t really get what he is doing, but none the less it will just be a matter of time until it clicks. We are approaching birthday season in our house, and one of the birthdays will be Minecraft themed. I found a few options for Minecraft birthday invitations online, but you have to buy them. Who doesn’t love free printables? We wanted to offer a FREE Minecraft birthday invitations since the Angry Birds Invitations were so popular and well received, I have a feeling these will be as well. So let’s get you a free printable Minecraft invite for your Minecraft themed party. Looking for a free Fortnite invitation? We have that, too! The best part of these free Minecraft invitations, it’s easy to personalize! Follow the below directions and learn how to customize the free DIY Minecraft birthday invitation to your liking. We have also added a free Evite Minecraft invitation template – keep reading to see this! This Minecraft invitation is 5 x 7. If you are looking to mail this like a card, send these in a A7 envelopes – these are 5.25 x 7.25. Let’s look at how to personalize your party printable. Editing the invite is SUPER easy. I went through and made sure of this – you can see a completed invitation below. Here is how you do it. Make sure you’ve downloaded the invite first, and then follow these steps for easy editing. Select the Minecraft invite file from wherever you saved it to on your computer. Using the Add Text function, add the party details to the invitation. I have an upgraded account at PicMonkey so I have more font options. I used the Times New Yorker font (the items in green and the RSVP). I used the Didact Gothic font for the party details. Next, add in any details you want. And then hit SAVE. Love the way the pixel look of this invite came out! Last – you will want to save your invitation as SEAN – the highest quality – if you are including in email or an evite, you can save as a Roger or Pierce. These are FREE, the only thing I ask is that you please share these with your friends. Pin, Facebook Like, Tweet, Stumble. Digital Invitations Free to Send and Print! Since you get the invites free, why not send a digital invitation? My favorite service for sending digital invites is Evite. It’s super simple with free options. This so saves the headache of printing, mailing and addressing! We are all about simplicity so one of my favorite party hacks is using evites to manage our party attendees and RSVPs. Evite has really upped their game in allowing you to send free party invitations or premium invites! 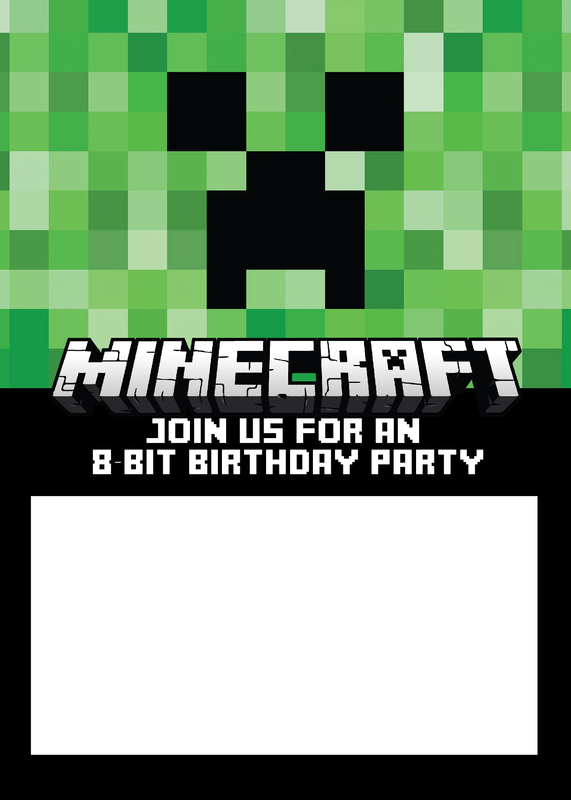 If you are looking to simplify your Minecraft party – send an evite rather than printing invitations. We’ve create free Minecraft invites evite graphics! These will make sending your birthday invites even easier. Click here to create your evite. Determine which size of graphic you need. Click save as on the graphics below and save to your computer. Upload the appropriate size graphic. This is the most popular size evite graphic. You can use this with both free and premium evites. Check out our Minecraft Party Ideas for ideas that you will love for your themed party – birthday party cake, decor and more! We can’t wait to see pictures from your Minecraft birthday party! This is so awesome. I was able to download the invitation & update w/ our own information without any problem. Thank you so much for sharing. My son is so excited that he gets to pass these Minecraft invitations out to his friends. Thank You soooo much for this idea, my son will be so excited!!! Thank you so much! The invite was exactly what we were looking for and the editor was great! I tend to find ideas like this from wonderful people like you and forget to say thanks. SO…..Thank you from a work-at-home Mom, throwing a party together on the fly, for your creativity and help! Thanks so much for the invite and the tips for using Pic Monkey to add in our info- so helpful!! Thank You, Thank You, Thank YOU! My son is going to be SO excited! Your instructions were super easy to follow, and it looks great! Thank you so much not only for sharing your idea but walking us through the process. You made it really easy for us. My son wanted a Minecraft-themed birthday party. He will be so happy to see these invitations! Hi. The invite is perfect for my sons party. I am not able to download it. I need help to figure out how to add the text in the white part. I just want to add my details into the invitation you created. When I click, “Add text”, it stays on the word, “Minecraft” and I can’t figure out how to get the text in the white box. Downloaded, edited, and then had them printed at Walmart as 4×6 photo prints. They came out amazing and only cost $3.80 for 20 invitations! Thank you so much for sharing! these are perfect for my grandson’s 7th birthday, I’m trying to edit but having some trouble. Is there any way I can change the “Join us for an *8 Bit and have it say ” a BBQ Party?” I can’t seem to edit that part. Thank you so much for any help you can provide. You’ve saved me tons of work with these..
Their is also an iOS app that lets you make Minecraft Birthday cards and invites with your kids name in Minecraft type style. It’s called “3D invite maker” in the Apple app store. You should check it out!